School kids playing chess in secret during class. Bar patrons shouting at slow moving chess broadcasts. What happened here? Spoiler: It's not all about Magnus. The chess world championships were on, and something was up. Wherever he rode, whether by bus or subway, Kristoffer Gressli couldn't help but notice. All those fellow travelers, staring into their screens, that wasn't new. But when he caught glimpses of their screens, he saw that they weren't posting to Facebook or watching cute cat videos on loop. "It was amazing", Kristoffer says. Norwegian Magnus Carlsen, the reigning world champion, had been part of the global chess elite since the middle of the 00s. During his ascent at the world championships of 2013, Norway fell into a chess frenzy that so far has showed no signs of slowing down. Kristoffer, director of the newly opened chess bar The Good Knight in Oslo, says a typical yardstick for measuring growth has been the membership stats of the Norwegian Chess Federation. Normally lingering around 2500 players, they've now hit a steady 3500 to 4000 members. "However, the large scale interest in chess isn't really measurable, because people are now playing chess on their cell phones wherever they might be." A teacher had put a video game on the curriculum, but caught some of his pupils hiding a second screen. A stealth game of chess had distracted them from the video game. 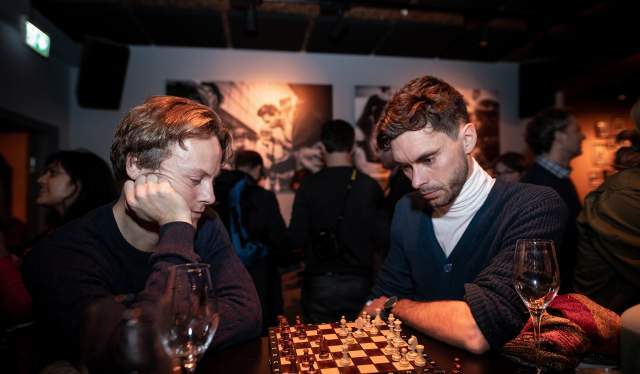 With chess enthusiasm at peak levels, and just in time for this year&apos;s world championships, Kristoffer and a group of fellow chess lovers decided to open up their own chess bar. The Good Knight is an all-in-one chess destination in downtown Oslo, and was opened to enthusiastic crowds by the city&apos;s mayor. Inside, the color palette ranges between brown and white shades of wood. Kristoffer and crew decided to discard the traditional black and white that is "the typical deal for anything chess-related." Here, guests are presented with chess boards integrated into every table and the option to play against their bartender, should no other opponents present themselves. Even though it&apos;s not really a sports bar, there are discrete monitors for viewing broadcasts of matches. During the broadcasts of the World Chess Championship in London this November, viewers who&apos;d never touched a chess board before could be heard yelling at the screen over Magnus&apos; moves, as if they were addressing an overpaid Premier League player klutzing around on the field. As Magnus fought to keep his title, the bar has been so full that long queues have formed outside. The New York Times recently paid a visit, and even Magnus himself dropped by ahead of the championships. "He wanted to check the place out before he went to London", Kristoffer says, emphasizing that the world champion did not have the wildest of nights. "Like, all he had was a soda." In addition to the world champion being a Norwegian, Kristoffer says the national interest is as much to do with the work done by state-owned broadcaster NRK to familiarize the broader public with the ins and outs of the game. "Chess can seem a bit elevated and intimidating. Online, there are plenty of shows about chess, but they&apos;re all aimed at the already initiated. Hearing grand champions discussing chess moves that are ten moves ahead is bound to throw people off." 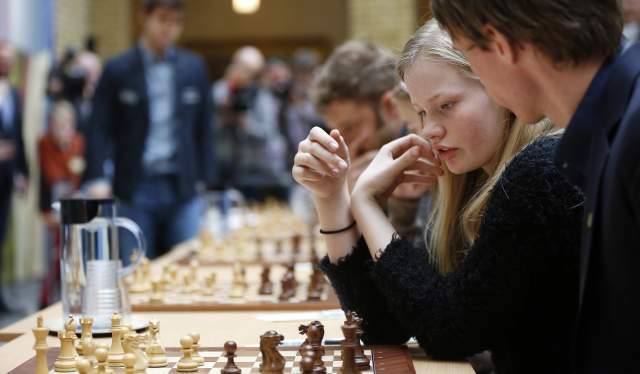 To Kristoffer, the way NRK has tackled this problem – utilizing a host that is on the side of regular viewers and who makes sure to keep experts in check - is has been one of the deciding factors in turning chess into both a national hobby and spectator sport. On average, Medier24.no reports that half a million Norwegians - 10 percent of the population - were following this year&apos;s championship on television. "The ratings are absurd. The chess broadcasts have more viewers than the national news. It&apos;s completely wild." Kristoffer also believes chess will prove a more durable craze than previous national pastimes. "When Alexander Rybak won the Eurovision Song Contest, all the kids wanted to learn violin. And everyone stayed up at night, watching the national curling team win an Olympic gold medal in Salt Lake City. But those things are less accessible than chess. If you have a cell phone, you always have an opponent in your pocket, anywhere." Kristoffer is himself an active chess player with the Oslo club Stjernen. For him, the game is about challenging himself and improving his skills. He'll ponder a single move for hours. "There is something truly great about the infinity of chess. Whenever you pull off some new move, you can feel yourself getting smarter. It's not really true – there are no links between chess and intelligence – but it feels like solving a really tricky crossword puzzle." "You might not think so – it often looks like a game of people pondering in silence – but many of my best friends are chess people. If you play with people you like, it's all the more fun." "How about playing against someone you can't stand – can that also be fun?" Kristoffer gives a short laugh. "It can be. If you win." 1. Seize control of the centre by moving your peasants towards the middle. This makes it easy to gain control over the rest of the board. 2. Get your officers, the pieces to the sides of the king and queen, out and into play. If they contribute to controlling the centre (see tip 1), that is a bonus. 3. Get your king to safety. This is done by moving your king two steps to the side, moving your tower to the other side of the king. This is called a rokade. It will have you working from a more secure position, so you'll be able to focus more on your opponents king. Norway’s art and culture range from Viking culture and wooden stave churches via the paintings of Edvard Munch and writings of Henrik Ibsen to modern design and cutting-edge architecture. Oslo’s unique location means almost unlimited opportunities for fun. Hike in the forest, swim in the fjord and go to a concert – all on the same day.